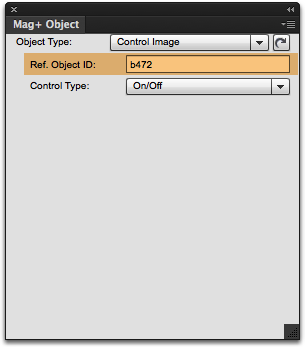 Mag+ supports a feature called Control Images that allow you show different images when a media file is playing. For example, a graphic can change from play to pause during playback of media. Single: A single image that disappears when the linked media is playing and reappears when the linked media is paused or finished playing. On/Off: Two images that change according to the state of the linked media. The first image is used to start playing the media. Once the media begins, the second image is shown. If the media is stopped, the first image is shown again. 1. Create the images you want to use and save them with the file name specified below. If using a "Single" control image, you can name it something like "start_image.1.png." 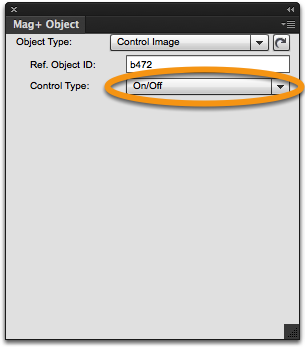 If using "On/Off" control images, you must name them with the same <filename> but with a "1" or "2" as the <id>. For example: "play_image.1.png" and "play_image.2.png." 2. 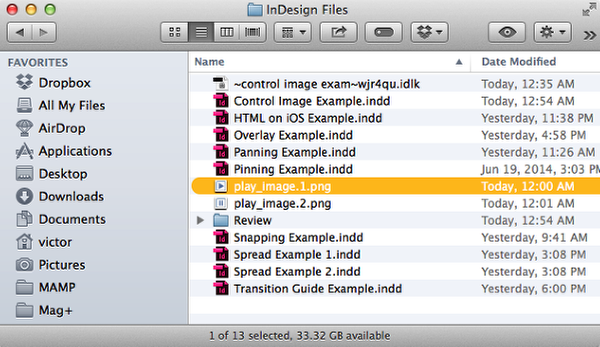 Place the image (or images) in the same folder as your InDesign layout. 3. 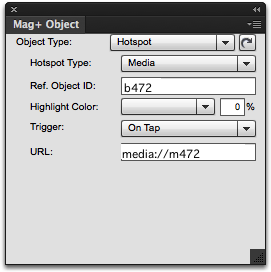 Add your linked media to the InDesign layout. For more information on adding Audio or Video to a layout, read the article "Adding Video and Audio to Your Layout." 4. 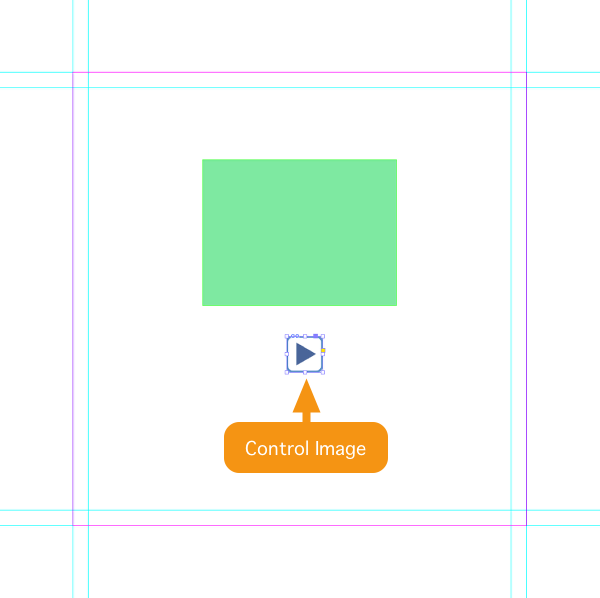 Place the first (or only) Control Image on your InDesign layout. 5. 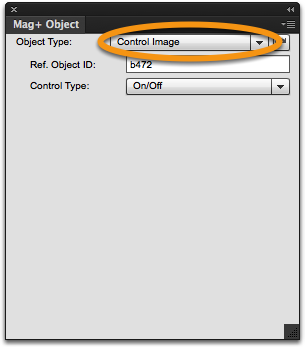 With the image frame selected, go to the Mag+ Object panel and set the Object Type to "Control Image." 6. Set the Ref. Object ID of the Control Image to the Ref. Object ID of the Media frame generated in Step 3. 7. Set the Control Type to "Single" or "On/Off." 8. 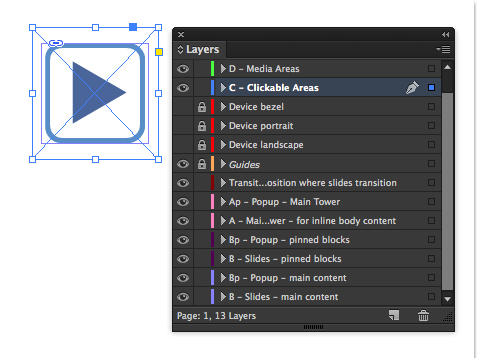 On the C-Clickable Areas layer, draw a frame that covers the Control Image. Tapping the area defined by the frame on the Clickable Areas layer will cause it to activate. Note: Any frame you manually draw on the C-Clickable Areas layer must have a background color set to "None" or it will obscure your placed image. Ref. Object ID: The Ref. Object ID from the media frame generated in Step 3. 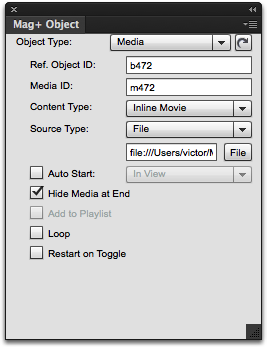 URL: The text "media://" followed by the Media ID from the media frame generated in Step 3. 10. Review your document on a Review device. The Control Image will now control the playback of the placed media. It will disappear or change according to options set in Step 7.